I’ve struggled with this post. One that I know that is necessary, but one that I want to handle delicately. Friday was an emotional day. I’m not going to refer to what happened on that day because I do not think it is relevant to this discussion, and the wounds are still far too fresh. But it was the type of day that you cannot plan for. While you certainly can’t plan for that type of tragedy as a parent, family member, friend or human being, it’s also difficult to plan for this type of news as a brand or business owner. I hate even writing those words because they sound callous. But the point is that too many brands came away looking tone deaf and insensitive because they were too focused on business to care like human beings. The problem, though, is that many likely were ready to put business aside. But they hadn’t taken the proper steps to address what was already in motion. I learned this on the fly. Hopefully I’ll never have to take these steps again. But we should be prepared, since undoubtedly there will be another big news event that will impact our planned messaging in the future. Understand that this does not mean you won’t be restarting them shortly. But you need to give yourself some time to evaluate whether your scheduled and promoted messaging will make your brand appear insensitive, out of touch or tone deaf. When big news like Friday’s hits, no one cares about your marketing messages. You need to understand this. More importantly, you could take a major hit to your brand if you do not adjust. Play it safe. This allows you the chance to observe how users are interacting with brands and determine whether your messaging will attract unwanted blowback. Once your messaging goes silent, observe closely. What are other brands saying? What are the reactions of Facebook users? I watched and winced as cheery holiday messages flowed into my News Feed from brands. Other messages were clearly planned before the day’s events. The reaction was emotional and negative. You can’t approach such a day as “business as usual.” Understand that particularly in the News Feed, your messages are surrounded by those of shocked, outraged and emotional friends. Your marketing pitch is out of place and unwanted. So take a close look and determine how similar brands are behaving and the user response. Do you have value to add to the conversation? Approach this very carefully. Once again, even a supportive and thoughtful message may be unwanted when it’s from a brand. Make sure that whatever message you share provides a unique perspective and will be accepted. In most cases, such messages from individuals or local brands will be embraced. But bigger brands may face greater scrutiny as users may question motivation. Know that you don’t have to respond. You may choose to go completely silent, and that may be the best decision. You will need to weigh whether your contribution is appropriate. 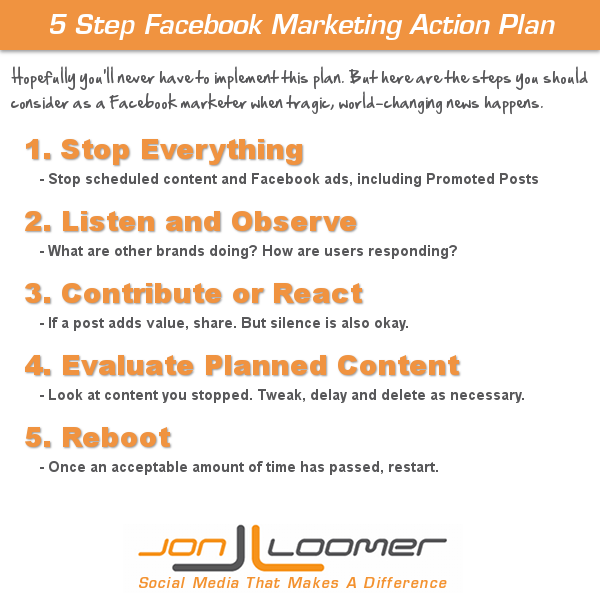 If you scheduled content on Facebook or with a third party tool, now would be a good time to take a look at what you had planned for the day. Or if you simply had a plan in general, you should evaluate how you expected it to unfold. Is it still appropriate? Maybe it is. But it’s possible you’ll need to tweak a word here, change the tone there, delay or delete the message entirely. When in doubt, delay or delete. Not worth the backlash. Once a certain amount of time passes, you’ll return to your original marketing plan. That could be 12 hours, it could be a day, it could be a few days. It all depends on the circumstances. 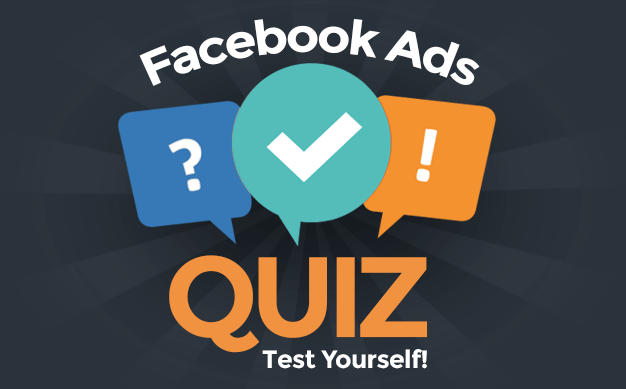 You’ll need to evaluate based on the conversations you are seeing from Facebook users. Are they beginning to move back to their normal lives? How are brand messages being received? It’s again best to err on the cautious side here. There is no rush to be first back into the flow. Take your time. Give yourself some time. Be cautious. Stop everything and then address. You may find that your plan was perfectly appropriately. If most of your messaging was in sidebar ads, that may not be as big of an issue as News Feed marketing. But it’s dangerous to address these things on the fly. Your brand’s reputation is at stake. Did you learn anything from the way other brands behaved on Friday?